The beautiful Mediterranean island of Cyprus has a world of wonders waiting for you to explore and the Atlantica Oasis Hotel makes for the ideal location from which to start your Larnaca holiday adventures. An ideal hotel for families, couples or lone travellers, guestrooms at Atlantica Oasis Hotel are plush, tastefully decorated and comfortable. At the Atlantica Oasis Hotel you choose how you want to unwind; take in the beauty of the Mediterranean from your private balcony, relax with a deep tissue massage at the Oasis Spa, enjoy a spectacular show on-site or simply go for a dip in the pool. 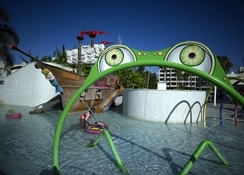 There's endless entertainment to be had at your hotel or away from it, so it's just a case of making your choice. 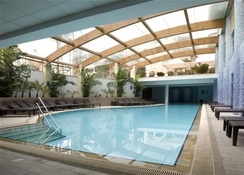 Together with excellent facilities, including swimming pools and gymnasium, and tempting restaurant choices, the Atlantica Oasis Hotel has something for everyone. Take in both stunning scenic vistas from Mount Olympos to Paphos Forest to the coast of the Mediterranean and rich cultural highlights from the city of Larnaca, the Atlantica Oasis Hotel is a gateway to all that this island has to offer. 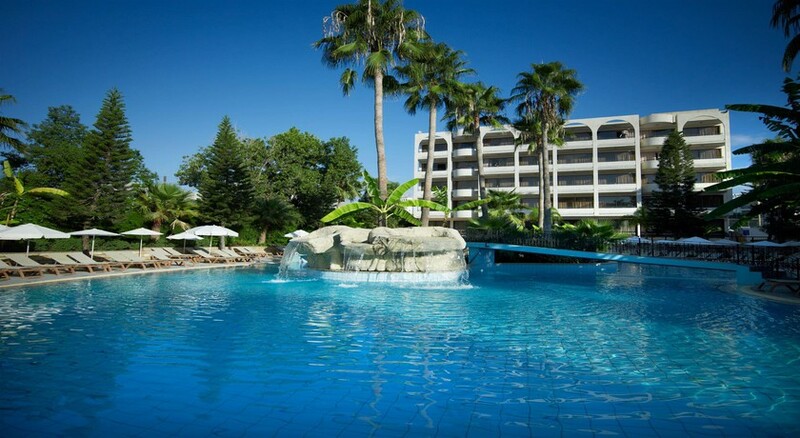 The Atlantica Oasis Hotel is located approximately 70 km from both Larnaca and Paphos International Airports. The town centre of Limassol is only 5 km from the hotel and features beautiful old town charm. 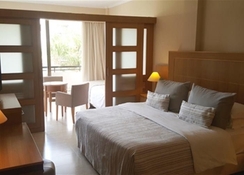 The Atlantica Oasis Hotel has a wide variety of accommodation to suit small and large parties. 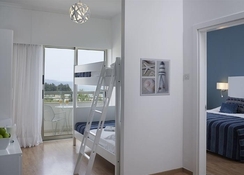 The Double Room with private balcony offers space for between 1 and 3 guests, while the Family Room provides separate sleeping areas for adults and children with one double bed and two single beds and a sliding partition between them. The Family Suite is also ideal for families with two rooms, including a double bed for adults and a separate room with bunk beds. The Junior Suite features a king size bed and a separate living area with a sofa bed that sleeps two. All rooms are fully furnished and come decorated with a neutral colour scheme that is light and airy and really opens up the space, while amenities include air-conditioning, a television and mini-fridge. The Agora Restaurant caters to both fine and casual dining throughout the day, while there are great children's options too as well as different food themes each night and fantastic show cooking stations. The Karavi Taverna is the ideal place to enjoy light and fresh tasting food, with options to dine alfresco with an incredible selection of barbecued meats or sumptuous sea food under the sun-filled Cypriot skies. For a quick drink head to the Zeta Cocktail Bar serving a wonderful array of alcoholic beverages to enjoy in a comfortable indoor atmosphere. The Italian Kitchen offers the finest Mediterranean fare, from stone-baked pizzas to delicious pasta dishes.